Sarah's teaching style places as much emphasis on proper breathing, relaxation and meditation techniques as the physical practice. 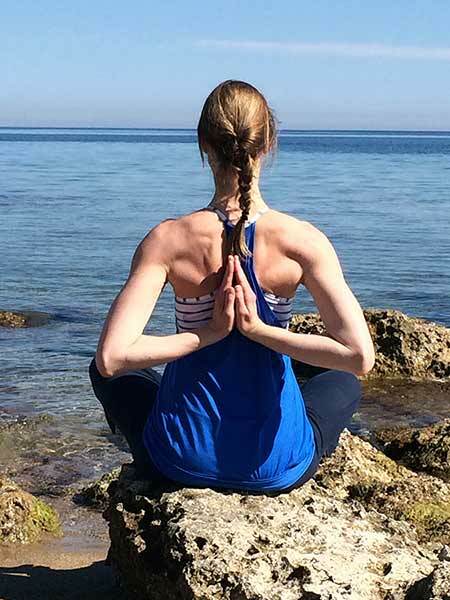 By encouraging a conscious connection to breath she allows students to increase flexibility, build strength, boost energy, develop mental clarity and creativity while creating positive affirmative change at every level. Sarah tailors her poses to suit students of all levels, giving every individual the courage to tune in, relax and enjoy their own yoga journey. On the mat, she encourages students to find that beautiful balance between flexibility and strength on the one hand and stillness and serenity on the other. 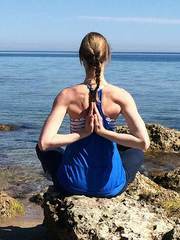 Since 2000, Sarah has immersed herself in a variety of yoga styles ranging from Hatha, dynamic flow, yin, pregnancy and children’s yoga. Qualified with the International Sivananda Yoga Vedanta Centre and Yogacampus for pregnancy, she is Yoga Alliance certified. Sarah is a fresh air yogi, revived by the restorative effects of practicing outdoors and takes her mat into green spaces or down to the sea whenever she can. She lives in the South Hams, teaching local group classes and private sessions in and around Kingsbridge, as well as London workshops and on retreats around Europe. Sarah brings serene sunshine smiles to her classes whatever the weather! ​Please book in with Sarah before attending a class - see Contact details below. Please contact Sarah to discuss how a private yoga practice can be tailored to your needs and around your lifestyle.